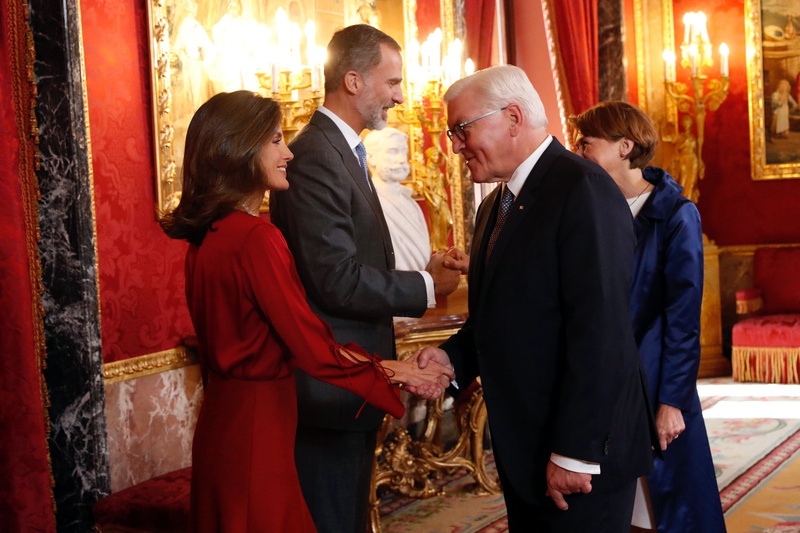 On Wednesday, King Felipe and Queen Letizia welcomed the President of Germany Mr. Frank-Walter Steinmeier and Mrs. Elke Büdenbender at the royal palace in Madrid. 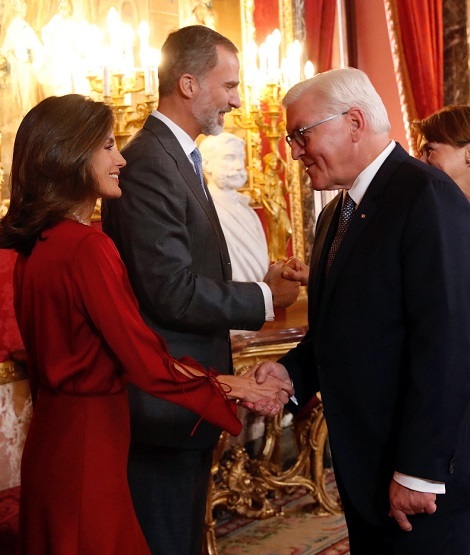 The couple offered a lunch in the honor of President at the Royal Palace of Madrid. 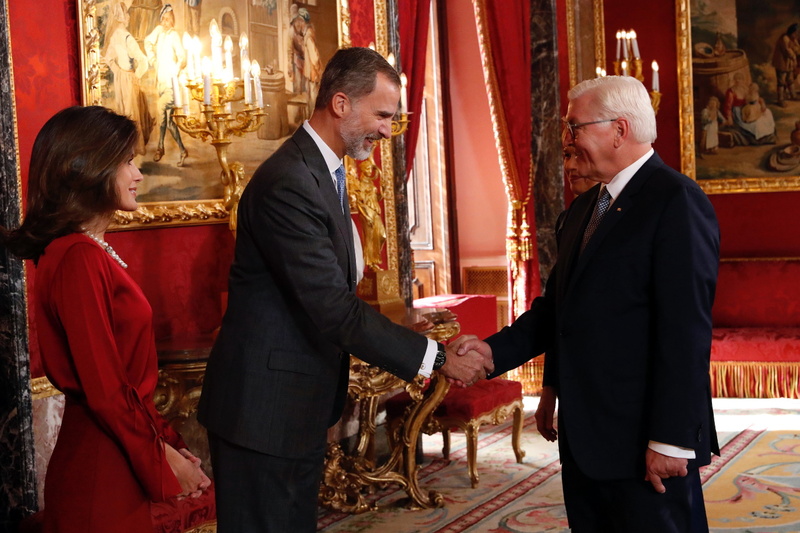 Prior to the lunch, King Felipe and President Steinmeier held a meeting at the Palace of Zarzuela. 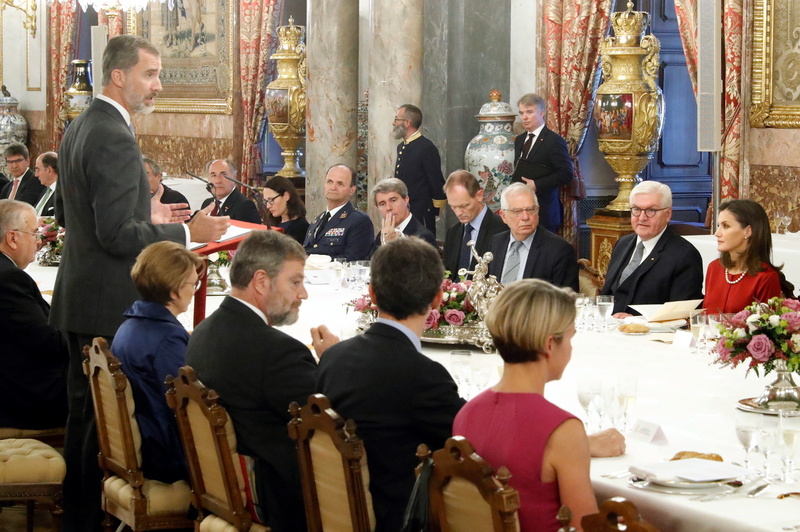 In his speech prior to the start of lunch, King Felipe stressed that, “Germany is a country that we Spaniards want and admire very especially. The history of our countries appears to us full of constant encounters in a way in which our peoples have exchanged their creative capacity for mutual spiritual and cultural enrichment “. 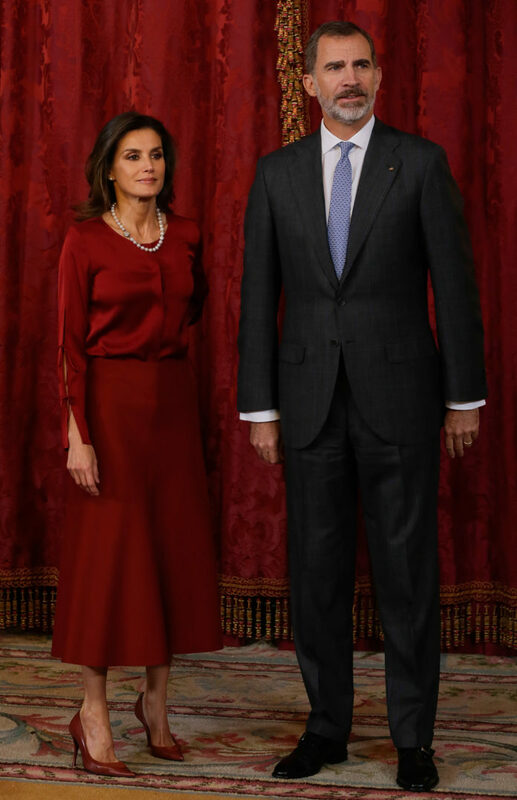 For the official event at the palace, Queen Letizia chose a dazzling outfit. She wore red blouse and skirt by her go-to label,coincidentally the German one, Hugo Boss. 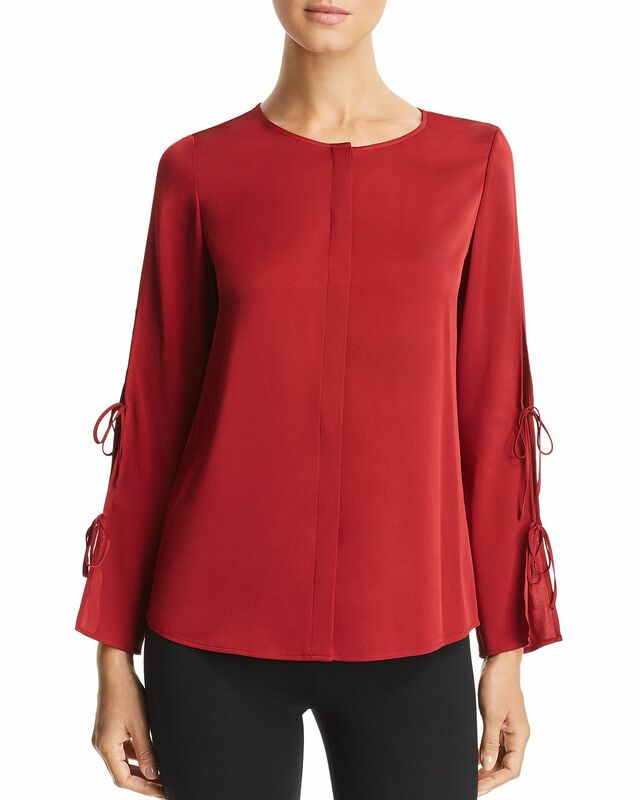 Letizia wore dark red Boss Burana Split-Sleeve Blouse. The blouse features round neck, concealed button front closures. The highlight of the blouse is its long split sleeves with tie details. The top is currently retailing at Bloomingdale’s for $295.00. 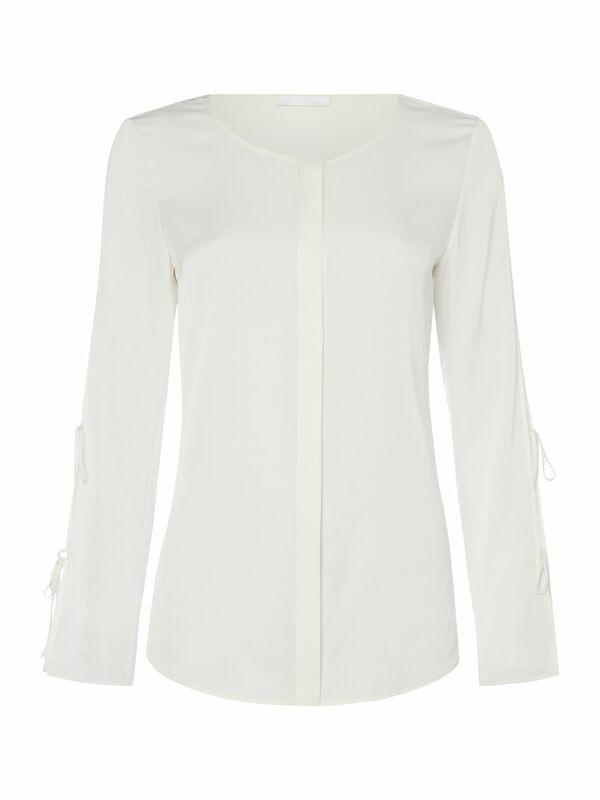 Burana blouse is also available in white at House of Frasers. Letizia paired the blouse with matching with Boss Vermana A-line Italian virgin wool and cashmere midi skirt. The $348.00 skirt is described as, “A luxuriously soft skirt by BOSS Women’s wear, crafted in a specialist Italian mill in virgin wool blended with cashmere. 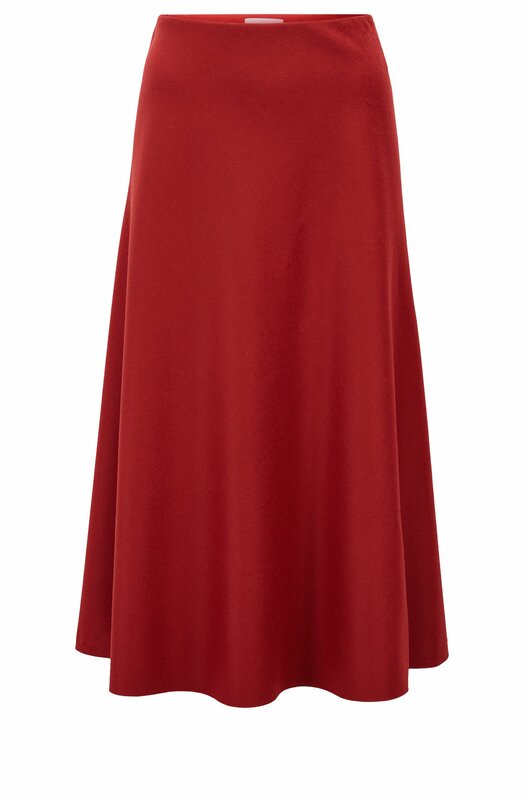 Featuring a subtle sheen and cut with a regular rise to a midi length, this flirty skirt offers a flattering A-line silhouette that falls below the knee.” Skirt is currently available at official online store of Hugo Boss. Queen paired the outfit with a new pair of leather and suede mix pumps from her trusty label Magrit. The noticeable element of her today’s look was the pearl necklace that came from royal jewel vault. Letizia was wearing necklace made of Russian pearls that belonged to Queen Maria de las Mercedes, the first wife of King Alfonso XII. King Alfonso gifted the necklace to his wife on their wedding. Maria died just after 5 months of their wedding. And necklace was passed to Alfonso’s second wife Queen Victoria Eugenia, who put it in royal jewel vault called, Joyas de Pasar, which passed down to every Queen of Spanish Royal Family. 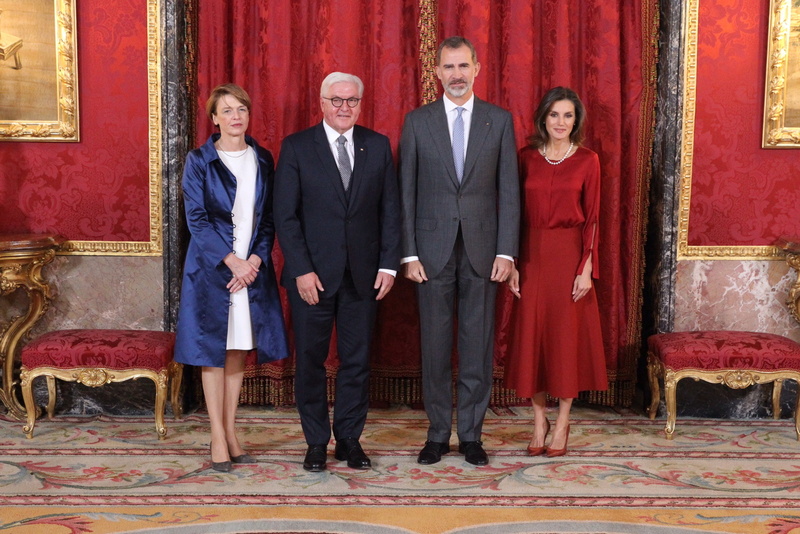 Letizia last wore the necklace at 2016 Princess of Asturias Awards. Next we will see Queen on Friday when she will be visiting Valladolid .